Bring water to a boil in a pot. Add butter and 1/2tsp sea salt. Add the carrots and reduce heat to a simmer. 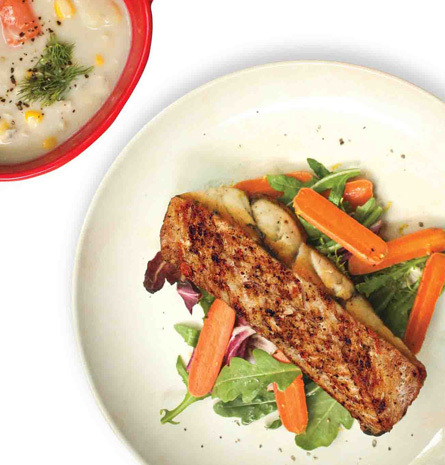 Cook for 10 - 15 minutes or until soft and remove carrots from the pot..
Heat barramundi chowder in a pot. Season both sides of the barramundi with sea salt and pepper. Heat olive oil and pan-fry barramundi , skin side up, for 3 minutes, then pan-fry side down for 1 minute. Turn up the heat and pan-fry for another 30 seconds - 1 minute till skin is crispy. 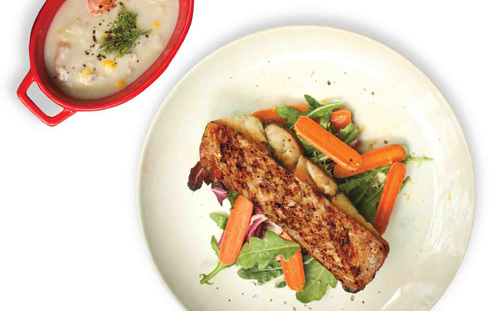 Place barramundi on a bed of salad greens and glazed carrots and spoon the barramundi chowder over.